← The hesitant salesman ~ Is Wood’s Home Maintenance Service the right company for you? At Wood’s Home Maintenance Service Your satisfaction is our goal! During the initial consultation I will ask lots of questions to develop a clear impression of how you want your finished project to look, what functions it will be used for and any special features you may want to incorporate. Using your sketches or photographs I will work with you to create a deck, sun room or patio design that fulfills your vision. If you are not sure exactly what you want you project to look like I can provide insight on design features along with photographs of other projects I have completed to help you with the design process. If there are any special construction or code considerations unique to your project I will make suggestions to resolve any potential issues. To fully realize your design goals it is important to carefully consider the basic shape of the structure. Where you place the steps in relation to the door entering your house and where you plan to place tables, chairs or other accessories, will have a dramatic impact on how comfortable and pleasant your deck or patio will be. To minimize wasted materials, the size and shape of the project should be considered. Angles and multi-levels are visually appealing but cost more per square foot to build and can actually decrease usability. Another often overlooked issue is simply what length the building materials are available in. It costs the same to build a 16′ long deck as it does to build one at 15′ because framing lumber is milled in even lengths . To assure the finished project satisfies both visual and functional requirements it must be designed accordingly. Your view or the views you may want to preclude can be determined by your choice of railings or the addition of privacy panels. Do you want a space for grilling? Are you more interested in a large expansive design or does having a cozy intimate area seem more appealing? From Hot tubs to fire pits, out door kitchens, arbors, trellises and more, you can achieve the look and functionality that best meets your needs by choosing the right design elements. Every project is unique and this often impacts how it is built. Property boundaries, septic systems, utility lines as well as the design of your home all influence structural decisions. 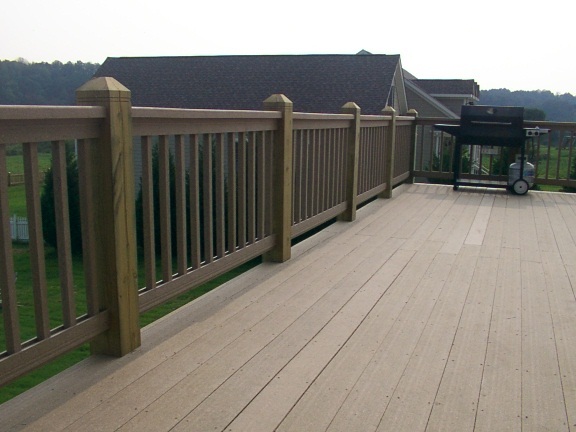 The type of materials used such as composite deck boards, vinyl or metal railings and even the various fasteners utilized during construction influence the aesthetics of the finished project. Building codes dictate many design features such as steps, railings, and bracing. (see “evolution of treated decks” for some insight on how building codes influence design) Structural requirements can often be achieved using more than one design strategy. By identifying and discussing potential structural, spatial and safety issues I can design a cost effective project that meets your design objectives. Not only should your project meet or exceed your expectations in appearance and function, it’s construction should also be a smooth process with minimal disruption of your life. I can advise you on the documents that will be required to procure your building permit and provide CAD drawings suitable for submission to the inspections dept. During the construction process we will keep the site neat and clean. All debris is removed from the site and properly disposed of. For safety it is some times necessary to restrict access to the construction area and the use of doors leading there. While we try to minimize the disruption of your routine, I am always available to answer any questions you may have. Additionally I will keep you updated on the progress of the project to ensure a smooth work flow and a timely conclusion. I either personally perform or closely supervise all the work that goes into every project from start to finish. This is your assurance that a project done by Wood’s Home Maintenance Service is a job done right. Whether you want a simple deck, a covered deck, a screened in deck or porch, a sun room, glass room, solarium or patio, Wood’s Home Maintenance Service can take you from the design stage to completion. Contact us today and we can get started building your dreams! This entry was posted in Decks, musings, Screen and Glass Rooms and tagged arbors, builders, carpenters, composite, Deck, deck boards, drawings, Glass Room, home, maintenance, panels, patio, Porch, quality work, railings, solarium, sun room. Bookmark the permalink.